Many readers will recognize Baum's name as the author of the Wizard of Oz stories, but how many know this book he also wrote? Originally published in 1902, The Life and Adventures of Santa Claus is a terrific telling of Santa's early childhood and how he came to make toys and eventually become the immortal man we know today who delivers toys to children all over the world. I liked the way it answered so many of those questions children have about Santa, but also explains some of the traditions such as why stockings are now hung by chimneys, and how trees ended up getting decorated. One of the best background stories is how Santa built his first sledge and was allowed to use reindeer one night each year to deliver his toys around the world. This particular edition, illustrated by Michael Hague, depicts all the creatures and beings that assisted Santa throughout his childhood and into his manhood; the Ryls who colored his toys, the woman known as Necile who fostered Santa when he was abandoned as a baby, the Master Woodsman of the World, and the horrible Awgwas who stole Santa's toys and tried to end his mission of making children happy. This would make a great read-aloud for older children who want to know all Santa's secrets. The chapters are short and accompanied by full-page color illustrations. It would be fun to read one chapter a night through December and finish just in time for the big night. Nate and best friend Given determine to enlist in the Union's army, but when Nate suddenly becomes crippled following a swimming accident, he can no longer pursue his goal of earning enough money to marry his sweetheart, and Givens' sister, Lila. Younger brother, Leander, determined to prove himself a man and earn respect from his family, takes Nate's place, even though he is several years under age. Though he tried to work hard and thought he was doing his best on the farm, Leander soon realizes that his attempts at helping out were nothing compared to the workout he is getting trying to keep up with the older enlistees in the army. Plus, due to his small size, he is a liability to himself and others. Leander ends up in a Union hospital in Georgia following an accident during which he is cared for by an equally young soldier named Paul, who Leander forms a relationship with during his stay. And he learns Paul's secret. Paul is a girl who pretended to be a boy in order to remain with her father while he fought the enemy. Now Pap is also in the hospital, fatally ill. After Paul and Leander bury him under a tree by the river, Polly, true to her word, immediately joins a group heading out to fight the rebs. Hiding her secret is not an easy one and Polly is constantly in fear of being exposed. This task becomes harder when she and three of her unit are captured and sent to Anderson prison. She doesn't know who to trust and conditions inside the outdoor prison are difficult at best. She is befriended by a tall, blond soldier who immediately identifies her as a girl. He keeps her secret and teaches her tricks to staying alive, like always boiling your water. Polly regrets ever having left Leander in the hospital and realizes her chances of finding him again are slim to none. The story follows Polly's struggle at Andersonville Prison through the end of the war, her release into Union hands, and subsequent misadventure aboard the Sultana, which explodes as it carries hundreds of soldiers returning from the war up the Mississippi River. The hopeful conclusion will please readers. This debut novel by Wiechman provides a captivating telling of some lesser known events of the Civil War. The great amount of research put into this book is obvious, and her wonderful use of the dialect creates an atmosphere pulling the reader into the middle of the action. The author's note at the end also includes more detailed information about the events depicted in the story, and a selected bibliography is provided for those interested in reading the books the author used for research. Highly recommended for middle grade readers who enjoy historical fiction, the Civil War, strong female characters, and adventure. This fantasy-adventure story begins in a contemporary boy's school where orphan Tom learns he has strange control over a map. He is quickly whisked away by a man with a peg leg moving into an alternate world that feels similar to a medieval time period, known as the Five Kingdoms. Here Tom meets a boy, named Porter, he learns is his twin. The two were separated at birth when a unsavory character named Keegan learned about a prophesy involving the boys that would end his rule. To avoid Keegan stealing one or both of the boys, their father had Tom whisked away to supposed safety. In this manner, Tom ended up transported to a life at a the Lost Preparatory Academy for Boys under the protection of a strict headmaster. Now on the eve of their 14th birthday, a countdown begins for the fulfillment of the prophesy. But the two must locate a missing sword for the true ruler (ala the Sword in the Stone) to overthrow Keegan and end his evil reign. Together, the boys are able to make the map come alive and reveal the swords' hiding place. Readers will enjoy following the brothers on their quest as they travel through each of the Five Kingdoms accompanied by a young girl named Willa and a young boy named Mudge. Overall, I enjoyed this first book in what looks like might become a series. There was one scene that I thought was perhaps inappropriate for this age group that involved Keegan planning their next evil deed, while drinking and speaking in a manner reminiscent of Darth Vader. He even wore a black cape. I could practically hear the breathing. That paragraph felt like it belonged in an adult novel. Otherwise, this is a solid book for middle grade readers who enjoy battles, sword fighting, chase scenes, narrow escapes, and the struggle for good over evil. Easy-to- read and not overly long. With all the unexpected twists and turns, and switched loyalties, it will appeal to the most reluctant reader. This non-fiction book provides the history of some of our favorite foods, and good nutritional information. Written in an extremely cool reader-friendly banter, kids will learn the origins of foods like hamburgers, chocolate, noodles, pizza, egg rolls, and fortune cookies in a lively, conversational manner that will make them want to keep reading. For instance, did you know that traditional mozzarella cheese comes from Asian water buffalo milk? And that's just one of the cool things about Rude Dude's Book of Food. It explains how our food comes from all over, and what we think about our food's history may not match up with the reality, which is way more interesting anyway. Each chapter ends with "A Poem for Dessert" that enhances the theme. The "Keep Being Awesome" boxes highlighted throughout the text include nutritional tips and factoids. The coordinating black and white drawings make this a really enticing book to pick up and thumb through. Readers can easily jump to whichever topic catches their eye. The final chapter is a wrap-up that provides ways for kids to become better eaters and challenges them to try new foods, like vegetables, and to not fall for the many marketing gimmicks that entice us to over-eat things we shouldn't. Core curriculum standards covered in the book are listed at the back, as well as as a few classroom connection ideas, which will appeal to teachers. This book will be popular with kids in grades 4-6, although the information is appropriate for all ages. Even adults. Did you know Mongols invented steak tartare? Remember that for your next trivia challenge. Very fun and easy-to-read. Highly recommended. Hilary Westfield longs to be a pirate and applies to the Very Nearly Honorable League of Pirates, who refer her to Miss Pimm's Finishing School for Delicate Ladies instead, since they don't allow girls to join. Her father, the Admiral of the Royal Navy, endorses this idea and would like nothing more than have Hilary abandon the idea of searching for treasure. But Hilary is a determined girl who can't be swayed. She packs the magic gargoyle from her father's estate and escapes from school to answer an ad for pirates on a ship run by the Terror of the Southlands, Pirate Jasper Fletcher, who is rather polite and non-threatening as pirates go. He has obtained possession of a map leading to a treasure buried by the Enchantress of Augusta and recruits Hilary to assist. There are many twists and turns as Miss Greyson, Hilary's governess joins the crew, as well as a boy who worked for her father. Things really heat up when the Queen commands Admiral Westfield to track down Fletcher's ship, the Pigeon, to reclaim stolen magic. As if that isn't enough, Miss Pimm relocates her school girls onto a floating division of the school and head straight into the chaos. No one is who they seem to be, and who will end up finding Augusta's store of magic is anyone's guess. This story has a difficult vocabulary (A.R. level 6.1) and will most likely appeal to young girls in grades 3-5 who enjoy adventures and magic. The narrator does a wonderful job on this book voicing each character distinctly, and makes it very entertaining. I enjoyed many of the voices, especially that of Miss Pimm. Also, all the pirate lingo, especially in the chapters from the manual of the Very Nearly Honorable League of Pirates (VNHLP for short), is quite amusing. If your child has trouble reading the book, I would definitely recommend trying the audio. Boys will even revel in the plot. Book 2 is available and might be a new series kids will want to follow. Two stories alternate in this book based on true events. 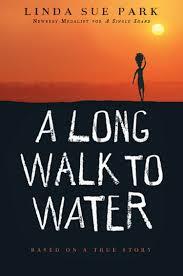 The first is about 11 -year-old Salva living in Sudan during a war that separates him from his family in 1985. After living in three refugee camps he becomes one of the "Lost Boys of Sudan" and eventually is taken in by a family in Rochester, NY. The other tells of 11-year-old Nya, also in Sudan, who must walk many miles twice a day to fetch water from a pond. The two stories converge when Salva realizes what it is he needs to do to help his native southern Sudan. Alternating between two narrators, I enjoyed that both spoke slowly and clearly with the dialogue spoken in the dialect of these Arabic speaking characters. The audio is also unique in that the thoughts of each character are given a sort of echo quality.The real Salva also provides a brief account of his current work with the Water for South Sudan project at the end of the audio and it is interesting to hear him speaking in English and giving his advice to young people. This deals with a serious subject and is recommended for listeners in grades 4-8 who are interested in world events, philanthropy, other cultures, and true stories. This is an early chapter book that includes a collection of four linked stories about family life set in modern West Africa. In one, Anna gets the opportunity to sing for the president. Another teaches Anna a lesson in why she must keep her hair in tight braids. Another allows Anna to travel to the other side of the city where very poor people live (this was especially endearing). In another the family gets a new generator for when the power goes out, and includes the many reactions it causes. This is a nice collection of stories for young elementary school aged children. I liked that the narrator used an African accent when reading the dialogue because I thought it helped create the atmosphere where these stories were happening. Also, the narrator really sang the song that Anna Hibiscus performed for the president (and she did it just as a child would - it was great!) The stories are relatable, yet provide information about another culture. Kids will enjoy this this longer option for an audiobook. Highly recommended, and an Audie Audiobook winner for 2014. I was immediately sucked into this story about 10-year-old Sugar who works on a sugar plantation in Louisiana following the emancipation of slaves. She works alongside the aging adults and earns pay. Her mother has died but left directions for Sugar to wait for her father to find his way back to their plantation. But years have passed without his return and Sugar hates sugar. She can't stand the taste or smell of it. She wishes she didn't have to do the backbreaking work of harvesting the sticky stuff. She wants adventures, and she finds some playing pirates on a raft with the plantation owner's son, Billy. They are forbidden to play together, but times are changing and the two are determined to remain friends. Billy's father decides on another controversial change for his plantation. He hires Chinese men to work for him. Sugar is very excited to meet them, but her elders are worried that they will lose their source of income, and their home. This is a very sweet story with the energetic Sugar who challenges everyone to think differently about family. I love all the accents going on here - recently freed slaves, southern, African. The dialects are spot on. Also, the folklore woven throughout is so cleverly utilized. Bahni Turpin is easy to listen to, and makes the listener forget she isn't a 10-year-old girl. I highly recommend this title. Matilda is an exceptional 5-year-old girl with cruel parents. She despises the way her father favors her brother and calls her stupid. She also hates the way he brags about the dishonest methods he uses to sell cars at his successful car business. Since she is so bright, she figures out a few pranks to play on him to tone down his behaviors, if only temporarily. For instance, she borrows a friends talking parrot and sticks it up the chimney one night to scare her father. Also, she switches her mother’s hair bleach for her father’s purple hair oil one morning causing his hair to turn white. She also put super glue around the inside brim of his hat so that he was unable to remove it once it was on his head. But Matilda is not a mean child. She just wants some recognition from her parents. She gets this immediately from her new teacher at school, Miss Honey, who cannot help but see how exceptional she is. Matilda can read (she has been going to the library everyday where the librarian helps her find more and more books, consequently she has read most of the classics) and she is extraordinary at math, a skill her father refused to recognize. She loves Miss Honey, but the Head Mistress, Miss Trunchbull, is a nightmare. She has an unlimited number of ways to torture the children who have misbehaved or not learned their lessons. Payback begins when Matilda learns she has one more extraordinary talent. 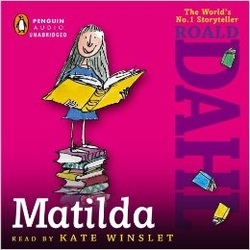 Kids will absolutely love reading this book and finding how Matilda is able to vindicate herself. There are so many strong and unforgettable characters. This Odyssey Honor Award and Audie winner is narrated by Kate Winslet and she does a magnificent job with all the voices, though some of the dialects were a tad hard to follow at times. Naturally, I like that there is a friendly librarian who takes the time to help Matilda, providing a good library message. One interesting thing I noticed while listening is that Dahl often uses prepositions to end his sentences. With. Ha! Highly recommended for middle grade readers grades 3-6 and as a read-loud for younger children. A.R. Level is 5. This is the Newbery Award Winner for 2014. Flora is a self-proclaimed cynic and avid comic book enthusiast. Ulysses is the unfortunate squirrel sucked into a vacuum. Luckily for the now hairless squirrel, Flora resuscitates him and proclaims that he is transformed into a superhero. At first, Ulysses only knows is that he has thoughts going through his head with the predominant one being "I'm hungry." Soon, though, readers realize that he can also fly and type. He leaves his most important thoughts on typewritten paper, which Flora's neighbor proclaims is poetry. But every superhero must have a arch nemesis, and Ulysses' is Flora's mother, a mystery novelist, who does not like the squirrel touching her typewriter. She schemes to dispose of him and a cruel and cowardly manner that involves the assistance of Flora's father. On her visit with him, Flora appeals to their nostalgic memories of reading The Illuminated Adventures of the Amazing Incandesto! together before he left the family. Other curious and entertaining characters appear throughout as Flora tries to save her superhero squirrel using the knowledge learned from the additional comics in the magazine including Terrible Things Can Happen to You! and The Criminal Element. Occasional comics are included in this story which is such an appropriate way to assist with the storytelling, and black and white illustrations are included throughout. Holy bagumba! This is a sweet story of love and friendship recommended for young readers in grades 4-6, but this would also make a good read-aloud for younger children (readers will have to define some of the vocabulary). In 1964, Gloriana June Hemphill is about to turn 12 years old and eagerly looks forward to another birthday party at the Hanging Moss, Mississippi swimming pool with fireworks afterwards at the 4th of July town celebration. But it doesn't seem like anyone is going to remember her birthday. The swimming pool suddenly closes "for repairs" and there are northerners in town that folks claim are stirring up trouble. Glory befriends Laura, the daughter of one of the so-called troublemakers from Ohio whose mother works at the Freedom Clinic. She doesn't seem like trouble to Glory, even though she wears long black socks and big clodhopper shoes. They help out the librarian at the public library and become friends, which is good because Glory's big sister Jesslyn suddenly doesn't have the time of day to spend with her. Jesslyn wants to move into her own room and is hanging around a boy from North Carolina who has a mysterious past, come to live with his aunt. And her best friend Frankie isn't acting like himself. He seems to be falling victim to his bully of a big brother, J.T., the town football star, who wants to get rid of the northerners and most-of-all that North Carolina boy, Robby, who could take his spot on the football team. Nothing is the same and nothing will be the same again. This story set as the segregation laws are changing in the south is appropriate for 9-12 year olds who enjoy historical fiction. Full of southern dialect, Elvis, and Robert Kennedy, this summer of a young girl's courage to fight for the civil rights she hadn't realized were even an issue when the summer began, is one of change and hard learned lessons for everyone.